Lead time for this product is 2 - 3 Business Days. Hollywog WiTouch is the first wireless remote controlled pain relief device utilizing TENS technology to specifically target back pain. Its thin and flexible design allows the WiTouch to contour perfectly the surface of the back for a perfect fit on virtually anyone. The WiTouch incorporates advanced electronics into its very compact design, maximizing energy effiency and providing over 150 30-minute treatment sessions per battery! This innovative device is safe, drug-free, easy to use, discreet & comfortable to wear, and most importantly allows you to control your pain to maintain an active lifestyle. Pain relief, is now just one click away! Includes: 1 Hollywog WiTouch Device, 1 WiTouch Remote, Package of Hollywog WiTouch Gel Pads (5 Pair), 2 AAA alkaline batteries, 1 CR2032 lithium battery (installed in remote), 1 Size #0 Phillips head screwdriver tool, 1 Storage Box, 1 User Manual, 1 Quick Start Guide, 1 Year Warranty. TENS/EMS Units & Stimulators can be found in our extensive online collection of products from globally recognized and trusted brands, including Core Products. 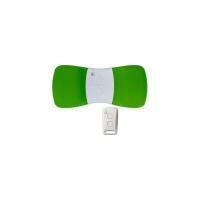 An excellent option to consider is the Core Witouch Wireless Tens Unit, Professional.